Sell 100,000 acres of State Trust Lands to balance the budget? My own calculations are that 100K acres at $100K per acre is $10 billion, but perhaps he's figuring in some other costs. Also, he seems to be assuming an annual return of 7.8% which is pretty good in the current economic climate. What isn't addressed in the report is the fact that these are not state lands, but lands held in trust for the beneficiaries. 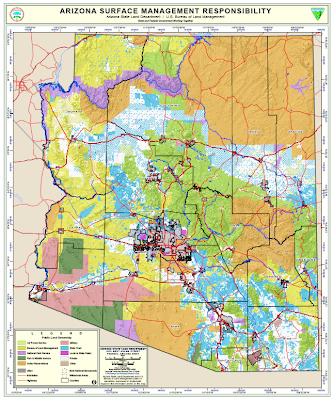 By the constitution and the federal enabling act creating Arizona as a state, those lands are managed by the state for the sole benefit of the beneficiaries. The largest beneficiary are the school children of Arizona, so perhaps the funds going to them would offset state general funds that could be shifted elsewhere. There is also the question of who is going to buy 100,000 acres at $100K each in the depressed real estate market. 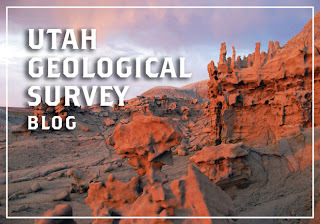 The Utah Geological Survey has been blogging since September 2008, but I just found out about it this past week. By my count, that now makes two State Geological Surveys in the geoblogosphere. They are taking a group approach with many of the UGS staff posting announcements of new publications and maps or describing some of the spectacular geologic features around the state. The Siberian mammoth on display in our state office atrium was dismantled yesterday and packed up for shipment to its new home [right, photo by Mike Conway, AZGS]. Lots of people stopped by to express their disappointment that it was leaving. Since February, the 12,600 year old skeleton on loan to AZGS from the Natural History Museum in Novosibirsk, Russia, has become a popular fixture. Visitors to the state complex have been taken aback seeing the 12- foot tall fossil seemingly walking out from under the trees. Many came back with their kids in tow to see the mammoth and the adjacent woolly rhino. One of the more surprised visitors was a prominent Tucson mineral and fossil dealer who had a client who happened to be looking for a mammoth. He contacted our Russian colleagues and arranged the purchase. The mammoth had originally been destined for a new museum in Asia, but that deal fell through and we offered to put it on display. The rhino is still here and we hope to convince our Siberian friends to bring a new mammoth when they return to the the Tucson Gem, Mineral, and Fossil Showcase in January. Numerous news sources say Arizona Attorney General Terry Goddard informed the bankruptcy court that the State of Arizona supports Sterlite Industries bid for Asarco. Last week Sterlite promised to pay Asarco creditors in full, in essence raising their offer by $500 million. The Arizona Daily Star reports that the states of Montana, Washington, and Texas also endorsed the Sterlite proposal as does the U.S. government. The bankruptcy decision could come this week. To celebrate these dual events Zion NP is closing the Zion-Mt Carmel Highway for 3 hours tomorrow evening, so that celebrants to walk through the 1-mile long tunnel as early visitors used to do. This is a one-time event that was 'sold out' by June. Anniversaries are a good time to take stock of the past and consider future directions. With that in mind, I want to repeat a long-standing wish of mine, to see the NPS recognize the importance of geology in some many of their parks, especially those in the West. A decade ago, a few visionaries formed the Geologic Resources Division in the NPS. 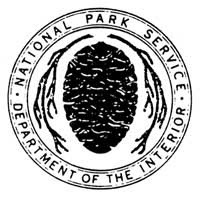 At the time, there were about 35-45 NPS employees with geology degrees (many were working in non-geology roles, such as collecting entrance fees) while there were roughly 800 biologists. That ratio of 20 to 1 has not changed much, and even more importantly, biologists hold virtually all leadership positions in the NPS. That by itself is not a problem, but historically there has been a preoccupation with flora and fauna to the near complete dismissal of the geology. So, you can visit some of the premier geologic parks in the world here and have to look hard to find interpretive materials or ranger programs on their geology. In the past few years, champions in NPS of the GRD have retired and it's not clear whether the new managers will continue even the minimal level of geology support in their system. So, happy birthday NPS. And in anticipation of your 100th anniversary perhaps you can start now towards becoming more effective champions of all the treasures under your care. Yesterday was the anniversary of what arguably was the worst flood in modern history in Havasu Canyon on the Havasupai Reservation. The peak discharge of the event was much lower than some other floods of the past century but it appears the total volume of water was higher. Trails, campgrounds, and other facilities were destroyed. Erosion threatened undercutting the slopes of tribal cemetaries on canyon bluffs. Helicopters evacuated 400-600 residents and campers. 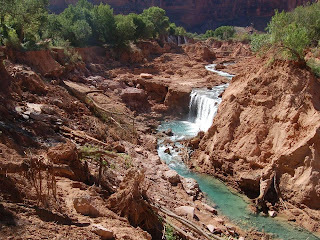 But the Havasupai Tribe started restoring and rebuilding immediately. The tourist facilities opened up on June 1 of this year and they were quickly booked. The iconic Havasu Falls was permanently altered, but the famous turquoise waters continue and pool at the base is rebuilding itself as travertine deposits are forming rapidly. There is still much work to do and lots that can be done to mitigate future floods but kudos to the Havasupai Tribe and their friends for a remarkable recovery. As President Obama arrives in Phoenix tonight for a visit to Grand Canyon National Park tomorrow, the battle over uranium exploration has taken a new direction. 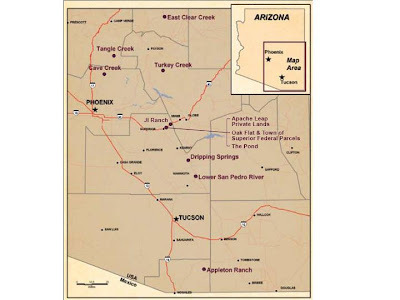 According to an AP report in the Arizona Republic, the U.S. Forest Service is now examining existing mining claims to determine if they are valid. If not, it seems the Forest Service will deny the claims, leaving the lands to be added to the million acres of federal lands segregated (effectively withdrawn) from new mining claims. Based on the news reports I've read, it sounds like the Forest Service is accepting arguments that exploration drilling should only be allowed if a company can prove the mineral (uranium in this case) is present in mineable quantities. Does this mean that claims can only be valid based only on the surface expression of a mineral deposit? This sounds like a very aggressive action by the USFS. If mining companies cannot do the exploration needed to prove up the mineral reserves before making major investments it could effectively end any mining on Forest lands. Will BLM follow suit? USFS is part of the Agriculture Dept, while BLM is in Interior. Kris Hefton, with VANE Minerals [right, uranium exploration drill hole in so. Utah. 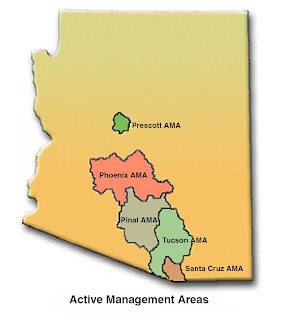 Credit, VANE Minerals], talked about this at the last AZ Geological Society meeting a couple weeks ago, but it's now becoming clearer what the potential impacts of the Forest Service action could be. VANE's claims are the first to be targeted by USFS. 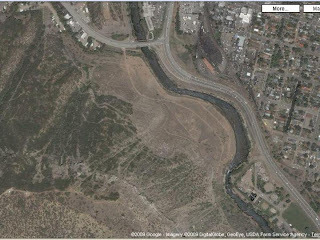 With the debate heating up over uranium exploration and mining in Arizona, Colorado is having a similar debate over reopening a uranium mill near the historic mining town of Durango [right, mill tailings pile. Credit, WISE-Uranium.org]. The Durango Herald last week published an impressive set of articles looking at the history of mining and milling in the region. I haven't read all of the articles yet, but the ones I have read are good. UA geology prof and dean of sciences Joaquin Ruiz published a well-written convincing op-ed in the Tucson Daily Star yesterday laying out the benefits the university brings to Arizona through education, training and jobs. I made the mistake of reading the online comments following the article. I thought there would be comments about the contributions UA makes to the community and economy. Unfortunately, the first group I read were angry, bitter, often ill-informed attacks from people who seem to detest our government. One theme was criticism of state tax dollars being used by the university. In the responses I didn't see this state specifically, but I understand that UA gets only about 30% of its funding from state appropriations, so it basically leverages those dollars 3 to 1 with outside funds coming into Arizona to create jobs and new opportunities here. That sounds like a good investment. The image from the UA-managed HiRISE camera on the Mars Reconnaissance Orbiter was released yesterday, showing tracks of the Opportunity rover on the left rim. 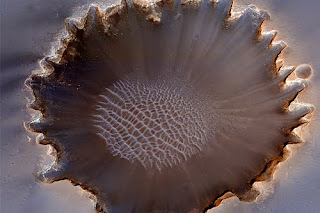 There are more equally stunning shots at the HiRISE web site. The Town of Marana has published a beautiful glossy color guide to hiking the many new trails in the Tortolita Mountains. And it's free! The brochures are available in our map-bookstore at 416 W. Congress in Tucson. We got a 2-page news release from the National Park Service yesterday full of bureaucratese on correcting health and safety hazards, scoping process, environmental assessments and so on. It took a couple of reads through before we figured out that they have federal stimulus funds to close old abandoned mines in 4 parks in Arizona - Coronado National Memorial, Grand Canyon, Organ Pipe, and Saguaro NP. While we all recognize the hazards associated with open pits, it turns out that some mines are in areas with wilderness "character," meaning getting in to do heavy duty reclamation will be difficult, some provide wildlife habitat, especially for bats, and some are listed or eligible for listing in the National Register of Historic Places. The public scoping brochures is online at the NPS Planning, Environment, and Public Comment website at http://parkplanning.nps.gov. The purpose of the meetings is to provide information and allow the public to comment on the proposed VANE Minerals, Inc. Uranium Exploratory Drilling Project, which would be undertaken on the Tusayan Ranger District. 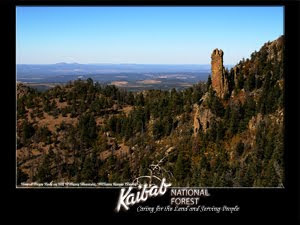 The Kaibab National Forest is preparing an environmental impact statement for the proposed project and is looking for comments on the scope and direction of the EIS. A Kaibab National Forest representative will present a brief summary of the proposed project at the beginning of the meetings, approximately 15 minutes after the start of each meeting. Kaibab National Forest is seeking public input during a 30-day comment period, which will begin Aug. 3 and end Sept. 2. The comment period is intended to provide local residents and the public with an early and meaningful opportunity to learn about the proposed project and participate in the process. VANE’s proposed project is to conduct uranium exploratory drilling at 24 sites on the Tusayan Ranger District. All drilling would be strictly limited to exploration holes. No actual mining of ore would occur at this time. For further information on the VANE Minerals Uranium Exploratory Drilling Project, please contact Tom Mutz, Lands and Minerals Staff Officer, in writing at Williams and Tusayan Ranger Districts, 742 South Clover Road, Williams, AZ 86046 or by telephone at (928) 635-5600. Questions regarding the Forest Service National Environmental Policy Act process may be directed to Alvin Brown, Forest NEPA Coordinator, at 800 South 6th Street, Williams, AZ 86046 or by telephone at (928) 635-8200. (1) what are the sources for uranium and other constituents found in the ground water in and around the Tuba City Open Dump? (2) what is the current distribution of ground water contaminants away from the Tuba City Open Dump (can plume limits be delineated)? (3) what controls the mobility of uranium and other constituents in and around the Tuba City Open Dump? The report is a summary of presentations given at a technical meeting requested by the BIA on March 3 and 4, 2009, in Phoenix, Arizona. 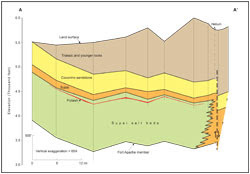 The information is taken from previously published USGS reports, (Open-File Reports 2009-1020, 2008-1380, and 2008-1374, and an Administrative Report on geophysical data). Ref: Johnson, Raymond H.; Otton, James K.; Horton, Robert J., Results and Interpretations of U.S. Geological Survey Data Collected In and Around the Tuba City Open Dump, Arizona, USGS Open-File Report 2009-1154, 125 p.
13. Peak Oil: Petroleum production reaches terminal decline. 14. Peak Water: The overpopulated, overheated Southwest runs out of H20. 16. Space Harvesting: China, Russia, and South Korea corral asteroids and harvest them for valuable minerals. 17. Oil 2.0: China, which produces more than 95 percent of the world's rare earth metals (materials like europium and erbium), develops a major, rare-earth-fueled breakthrough in energy production. The United States, lacking the natural resources needed for this amazing new power source, becomes impoverished and insignificant. 19. Geothermal Energy: In the post-petroleum age, we generate electricity by drilling into the Earth's interior to extract stored heat; we drill too deeply, causing massive earthquakes. 20. Nuclear Waste: Yucca Mountain and other nuclear storage facilities begin to leak radioactive waste. Everyone gets cancer. 26. Math and Science: American math and science aptitude deteriorates, killing innovation in the tech sector and pushing America to the back of the line of post-industrial economies. 27. Intelligent Design: Creationists succeed in getting evolution pushed out of textbooks. Scientific illiteracy dooms America to second-class status. 52. Asteroid: NASA's Near Earth Object Program reports there's a less than 1-in-45,000 chance the asteroid Apophis will smash into Earth on April 13, 2036. And there's no guarantee we'll be crater-free if we dodge this particular space rock. Duck! 53. Supervolcano: The last volcanic "super-eruption" near Yellowstone happened 640,000 years ago. The U.S. Geological Survey reports that "[t]hick ash deposits would bury vast areas of the United States." 54. Hurricanes: Six of the 11 most-intense Atlantic hurricanes have come since 1998. 55. New Madrid Earthquake: An earthquake of 8.0 magnitude or higher has a 7 percent to 10 percent chance of cracking up the New Madrid Seismic Zone—a region that covers parts of Missouri, Illinois, and three other states—in the next 50 years. 56. Floods: As temperatures rise, more of the country is at risk of massive, regular flooding. 104. Megadrought: If the world gets one degree warmer, the Great Plains are at risk of turning into an expanse of sand dunes. Bad news for American agriculture (and everyone who lives in Nebraska). 105. Climate Migration: Refugees from Mexico, the Southwest, and coastal cities flee the devastation wrought by climate change, overwhelming the American cities that remain healthy. 107. Climate Wars: Individual countries or "climate pirates" conduct experiments to try to halt global warming. War breaks out over uncertainty regarding the cause of freak weather events. 108. Geoengineering: A non-American nation or group of nations succeeds in using technology to turn off climate change. The United States loses power and prestige. 112. Ice Age: As in The Day After Tomorrow, circulation of water in the North Atlantic slows down, bringing on a new ice age. The northern United States gets buried under a glacier. 113. Rising Sea Levels: As Miami, New Orleans, and the California coast disappear, migrants swarm to the center of the country and overwhelm the nation's dwindling resources. 114. Heat Shock: In hotter growing seasons, staple crops succumb to withering temperatures, imperiling the national food supply. 115. Ocean Acidification: Increased absorption of carbon dioxide causes the pH of the oceans to decrease continually, leading to mass extinctions. Sterlite kicked their offer up to $1.67 billion and a note. Grupo Mexico countered with $1.72 billion and a note for asbestos claimants of $280 million. A Grupo spokesperson said their offer "amounts to 100% of the principal demanded by Asarco's creditors, plus $165 million in interest." Secretary of Interior Ken Salazar is scheduled to visit the Resolution Copper mine site near Superior, on August 21, at the request of John McCain, according to a story in the Arizona Republic. McCain is a co-sponsor of legislation to swap 2,400 acres of federal land needed by the mining company, for 5,500 acres of environmentally-desirable lands elsewhere. Sen. McCain has put a hold on some Obama nominees to force action on the bill. So far, the Obama administration has not taken a position on the land exchange, but Democratic congresswomen Ann Kirkpatrick is sponsoring companion legislation in the House. Southwest Exploration completed drilling of 4 exploratory holes on State Trust Lands near Holbrook to test the potash potential. The samples are being analyzed to determine potash extent and quality. The company did not drill fifth hole that was permitted reportedly due to access problems. The drill holes are the first new ones in decades, as the price of potash and last years AZGS resources report [right, potash layer in red] have attracted worldwide attention to this potentially world-class deposit. A magnitude 5.5 earthquake (marked by the star on the map at right) occurred at 02:13 am local time this morning in the Gulf of California, in the same area as Monday's 4 quakes (which ranged from 5.0 to 6.9 in magnitude). We've had no reports of it being felt in Arizona or of damage in Mexico . Map credit, USGS. 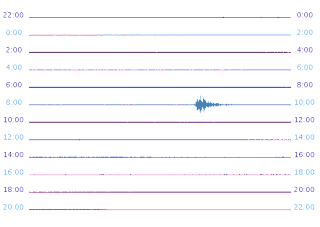 The seismogram on the left is from AISN station U15A at the North Rim, Arizona, showing the event on the 0800-1000 UCT line. Target is accepting applications starting today for 5,000 grants of up to $800 each for the upcoming school year to run field trips at the K-12 level. This is a great opportunity for local teachers to get their students out to learn about Earth science. So pass this along to teachers you know and help them submit an application online anytime between Aug. 5 and Nov. 3, 2009. 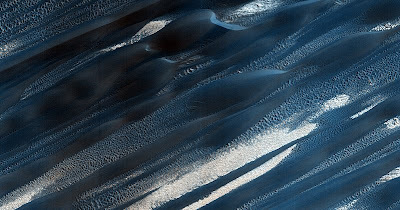 Dune ribbons on Mars, from the HiRISE camera on the Mars Reconnaissance Orbiter, managed by Univ. of AZ. The first weekend, 80 people showed up for the plant rescue effort. A much smaller group was out last weekend. But when word of the clearing plans for the two test plots circulated, some mine opponents feared Rosemont was starting mining operations without approval, and they alerted local news media. Watch for a story in the Arizona Star. 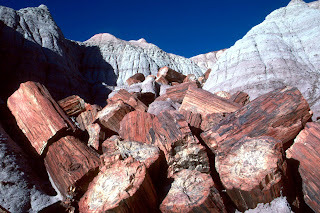 They say the park "resembles a moonscape with fossilized wood remnants scattered across its terrain. Visitors can hike along the Painted Desert Rim Trail or the Blue Mesa Trail, which is layered with plant and animal fossils. Notably, the Forest is the only national park to include a section of Route 66, America’s historic highway." 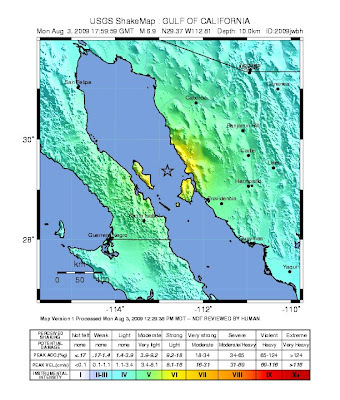 The UA Geosciences Seismology & Tectonics Group has set up a web page with reports and data from yesterdays earthquakes in the Gulf of California. Professor Sue Beck says graduate students Lepolt Linkimer and Andy Frassetto put it together and will be adding materials. 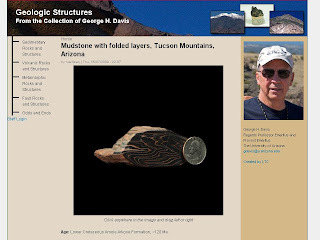 The University of Arizona has a new online geologic teaching tool showing rock structures in interactive 3-D format, using the collection of geosciences professor George Davis. Using your cursor, you can rotate the samples around for 360-degree views. 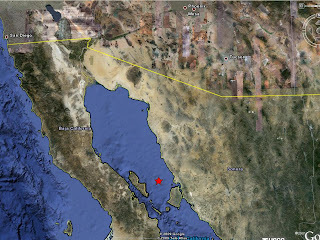 There's a nice Google Map application that posts locations of people reporting they felt yesterday's M6.9 earthquake in the Gulf of California. Many of the posts are from the USGS web site that collects this information. There are just over 1000 responses posted as of 8:30 am this morning. 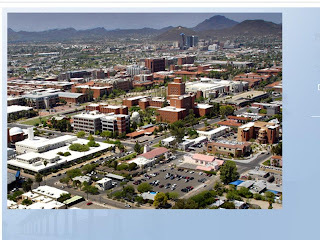 Thanks to Ramon Arrowsmith at ASU for pointing out the Google site. "part of a broad research effort taking place throughout North America to validate the capability of deep geologic formations to permanently store CO2 produced from industrial sources, thereby preventing its emission into the atmosphere where it would contribute to global warming. 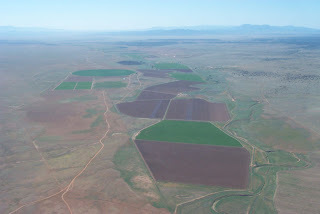 "The goal of the WESTCARB Arizona Pilot is to field-test the feasibility of CO2 injection and storage in the Colorado Plateau’s saline formations—deep-lying porous rock formations filled with saltwater that cannot economically be made suitable for drinking water or agriculture. WESTCARB’s regional characterization studies suggest that suitable CO2 storage sites lie beneath or near many of the coal-fired power plants in northeastern Arizona. 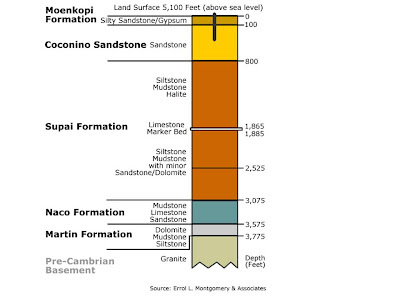 The Arizona Pilot will help validate this assessment and indicate the viability of using these geologic formations for larger CO2 storage projects, which may play an important future role in lowering greenhouse gas emissions." "If geologic conditions at depth are appropriate, 2000 tons of CO2 will be injected about three-quarters of a mile underground. Although this is a relatively small quantity of CO2, it is sufficient to test monitoring techniques for tracking the location of the injected CO2 and ensuring compliance with environmental and health and safety requirements. The CO2 injection is expected to take less than three weeks, while monitoring of the CO2 plume in the formation will continue for three to five months after the end of injection." As of 3 pm today, the USGS has received 825 reports from 220 zip codes and 11 cities, of shaking from the M 6.9 earthquake this morning. You can report directly to the USGS. But Bob Anderson with the Calif. Seismic Safety Commission called a while ago, asking if we could help with an engineering study they are doing. They are examining long period seismic waves and their impacts on tall buildings, especially those 16 stories and more. Here in Tucson, we've heard it was felt in the 12 story Unisource building and on the top story (5th floor) of the State Office Complex next to us. We have very little real data on engineering seismology or strong motion effects, because our large earthquakes in Arizona occurred before modern equipment was available and installed to record the results. We may be able to learn something from this event that will help prepare us for an earthquake closer to home. So far, there are few reports of damage and no reports of injuries from today's M 6.9 earthquake in the Gulf of California. 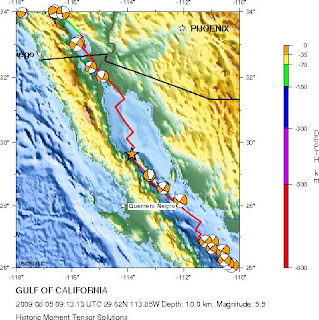 One reason may be that the motion was strongly strike-slip (right slip, as would be expected for a transform fault in this region) and the energy was focused along strike to the northwest. The USGS is now posting moment tensor solutions for the quake showing a northwest solution of 313 degrees and dip of 90 degrees (for the centroid). One of the best visualizations of this can be seen in the Southern Calif. Earthquake Center (SCEC) simulations of motion on the San Andreas fault. I particularly like the pair of videos showing both north and south propagation. 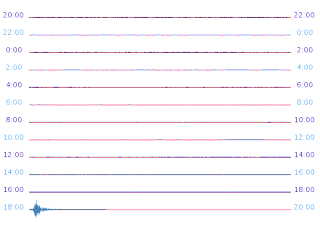 Notice how the velocities are highest in the direction of fault propagation and drop off quickly to the perpendicular. There is no moment tensor reported for this morning's Gulf quakes, but we expect they are right-slip events, and shallow, which greatly reduces the potential for tsunami activity in the Gulf. The Mexican SSN (Servicio Sismological Nacional) is another resource. You can sees the seismic waves from this morning's M6.9 earthquake in the Gulf of California on the AZ Integrated Seismic Network station near Wickenburg (station Y14A) at the bottom of this screen shot. The quake occurred at 17:59:59 UTC or 10:59:59 local time. 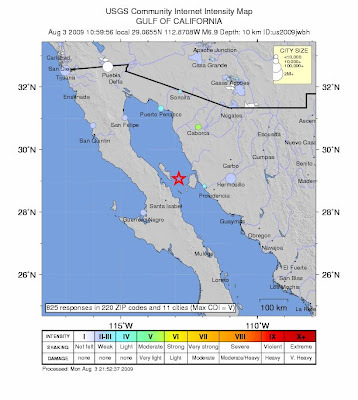 Residents of Phoenix are reporting feeling an earthquake about the same time as a magnitude 6.9 event occurred in the Gulf of California, west of Isla Tiburon at 11 a.m. local time this morning. Two other moderate to large events occurred about 5 minutes prior to the main one, with magnitudes of 5.8 and 5.0. [1:10 pm correction - only the 5.8 event was a foreshock. The 5.0 event occurred about 30 minutes after the main shock]. 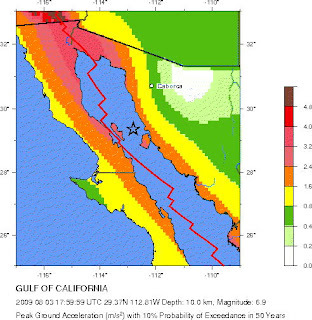 A magnitude 6.0 event followed to the northwest. Update 12:45 pm: reports are that the main shock was felt across southern Arizona, not just Phoenix as I first reported. What happens in the 101st year when a community's 100-year assured water supply runs out? The Arizona Republic's Shaun McKinnon wrote a pretty provocative indictment of Arizona's groundwater situation in today's paper. One of the problems he notes is that while many communities are injecting water into aquifer 'water banks' for future emergency use, adjacent communities may be draining that water with their own pumping. The trip between Phoenix and Las Vegas, two of the largest, fastest growing cities in the country, is a frustrating experience in endless traffic lights, long stretches stuck behind slow moving trucks and RVs and a constant search for some short cut to make the typically hot trip a little less tedious. 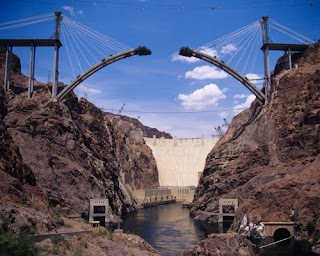 The good news is that the Hoover Dam bypass bridge over the Colorado River (also known as the Mike O’Callaghan-Pat Tillman Memorial Bridge or Colorado River Bridge), is only a few weeks away from completing the 1,060 foot long arch connecting the Arizona and Nevada sides. This weekend's Las Vegas Sun has current photos that are more up to date than the bridge's official web site. The bridge is scheduled to be completed in Sept. 2010. The Prescott Daily Courier has yet another perceptive story about the potential impact of groundwater withdrawals on the Verde River. ADWR director Herb Guenther is quoted saying, "Sooner or later, they're going to impact the flow of those (Upper Verde) springs, which impacts the flow to the Verde." Those who agree with Guenther include numerous Middle Verde elected officials, several environmental groups and the powerful Salt River Project, which gets much of its surface water for Phoenix-area customers from the Verde River. Wilson has labeled them all "eco-nuts." Scientists and recent U.S. Geological Survey studies generally agree that the Big Chino supplies at least 80 percent of the Upper Verde flow during dry seasons.